If you missed #7 click here. Best Moment: Oh man, choosing one moment... so tough! Probably nailing the power sliding turbo boosts the full maximum of three times, it's a difficult but fun art to master and it makes a huge difference to your racing. I think I may have said this before, but again I'll say it, I do think this is better than any Mario Kart game. It's probably because I was a Sony Playstation kid growing up and not a Nintendo kid, but I clocked so many hours on this game it was unbelievable. The one negative thing about this game is simply, that there's not as much access to 4 player racing, unless you bought the multitap, something that was a lot easier on the Nintendo 64 and the Nintendo Wii with their setups. But when it comes to single player mode, I truly believe this game is the king of kart racers. 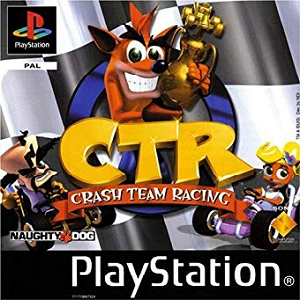 What I love about Crash Team Racing is the single player mode, where you drive to each destination and race for the trophy, CTR tokens and relics, and each area of the map has its own boss. 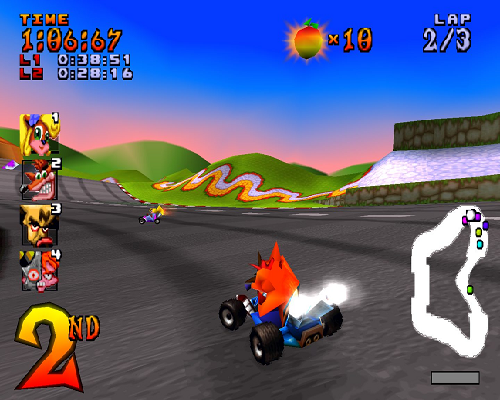 I just think this layout is really cool and each individual track in Crash Team Racing is very different from the last. Sure, you could argue, that some the tracks in CTR are heavily influenced from Mario Kart, and I'd agree with that statement. But I just love the slickness of the racing, I love the differences in abilities within each character, and, of course, I love the Crash Bandicoot flavour of a kart racing game. Lots of people are asking for this game to be remastered, and I agree, I'd love nothing more than to see it re-done, but right now I hope that Activision concentrate on making a brand new Crash Bandicoot game, rather than rely on this which probably would make them a lot of money - just keep the fans waiting a little longer! Want to find out what kicks off my Top 5? Click here!